Before we jump in, you need to understand the difference between Gift Certificates and Gift Cards! Gift Cards are processed by Chase Paymentech and stored through Givex, so you need to have Chase Paymentech Integration to use them. Gift Cards are plastic cards that can be swiped on your payment terminal and the balance is directly connected to the specific card number it was applied to. 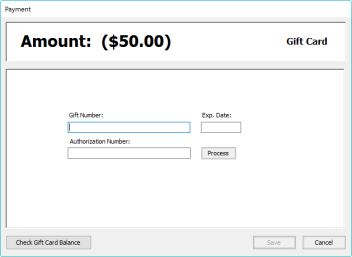 You should use the Gift Certificate payment type instead of gift card. Gift Certificates are typically paper and made in your shop. The certificate balance is stored in Ascend and directly attached to a customer's account. So the sale should be associated with the person receiving the Gift Certificate (that will be redeeming it), and not the person buying it. Sherpa TIp: You'll need to sign up for gift cards in addition to your regular credit/debit card processing. See Dexter to get started. You should use the Gift Card payment type. Since the gift card balance is directly attached to the plastic gift card itself, you can associate the sale with the person buying it. 1. Create a new Sale and attach the customer. 2. Take their payment for the Gift Card (for example, $50 in cash). 3. The sale balance now shows in parentheses, indicating a negative value (where the shop owes them). 4. Select Gift Card from payment types. 5. The Amount will automatically in fill in with the negative amount in the balance field. 6. Swipe the card to apply that amount to it. 7. Close the transaction like normal. Anytime you see a dollar amount in parentheses in Ascend, it indicates a negative amount. this means the shop owes the customer money in that situation. Gift Cards, Gift Certificates, and In-Store Credit are common examples of this. How do I check a Gift Card balance? You can check a gift card's balance a couple ways in a sale in Ascend. Select Customer from the top tool bar > Check Gift Card Balance. Or select the Gift Card payment type > Check Gift Card Balance. Then swipe the card or enter the card number and select OK to see the card balance.